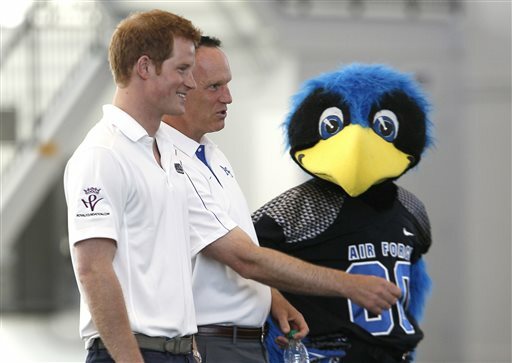 Prince Harry, left, watches an American football demonstration Sunday with Air Force head coach Troy Calhoun, center, and team mascot “The Bird” in Colorado Springs, Colo. Prince Harry of Wales is third – soon to be fourth – in line of succession for the throne, has proven he has skills playing football, but not just the English version. The prince learned about American-style football at the Air Force Academy while he was attending the Warrior Games for wounded U.S. service members. It turns out the prince has a real cannon for an arm, said Troy Calhoun, head football coach for the academy. He fired a pass at least 30 yards. The prince also showed he’s got what NFL commentators call “the quickness” when he went long to make a catch. “Showed good speed, very good skill in terms of being able to make a catch and yet at the same time being a pretty fluid athlete,” Calhoun said. As a soldier himself, the prince showed he has enormous respect for service members, especially wounded warriors, Calhoun said. The day before coming to the Air Force Academy, the prince attended the Warrior Games, where about 260 athletes competed in sports including basketball, volleyball and swimming. “It is a great honor for me to be amongst so many fine athletes, such inspirational people … an honor difficult for me adequately to put into words,” he said in a speech. The prince recently returned from a deployment to Helmand Province, Afghanistan, during which he served alongside U.S. troops.